Little Hedgehog and Friends was featured on Portuguese newspaper Público! Click to read and see more drawings. 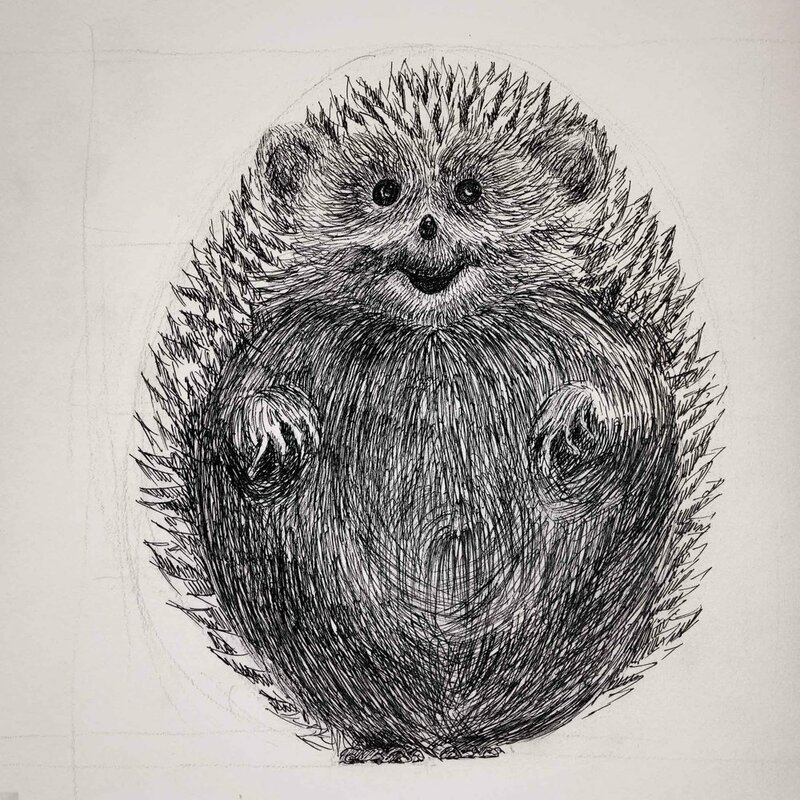 Little Hedgehog is an adorable hedgehog who enjoys the little pleasures in life and loves to eat! He is a good friend, loyal and selfless. He lives in a tree house, right in the middle of the woods. The little door is barely visible between the thick roots... but once you enter... oh joy! The smell of freshly baked scones, the white curtains floating in the morning breeze! "Hello, internet. I don't have a computer, but I understand the internet is a very big group of friends. I only have a small group of friends. They are fine, but I wish they would be careful and not walk over my garden. The other day Randy jumped all over my carrots. I hate it when people are careless. I live in the woods, which aren't bad. At least, they aren't as bad as the Big City. I would hate living there, with all the noise and all the people. " You can spot Jebedu in his boat at night, roaming the stream under the moonlight. Where is he going? What does he do? No one knows for sure. He slides mysteriously through the night in his little nutshell boat... off he goes, silent and meditative. His home is a hut right by the stream. If you see a puff of smoke coming out of the chimney, you know he is there, working on fantastic experiments or reading ancient books. He lives surrounded by marvellous objects brought from distant lands, for Jebedu has lived in many places and seen many things. He remembers fondly his time in the monastery, all the monks happy under the shiny sky. Meb lives on a tree house. She likes hot coffee and chocolate, and usually carries a slab of dark chocolate with her. She is fun, down to earth and easy going, making her a perfect friend to hang around with. The only thing is... she doesn't have much patience to put up with Morris. He huffs and puffs and moans all day round, and that makes her go crazy! She is very good friends with Little Hedgehog and they often bake cakes together. She also loves to knit. Ratty doesn't live in the woods - he is a proud inhabitant of The Big City.. Ratty came from New York in a ship when he was very young, and was adopted by the Squeakins. The Squeakins are an adorable family of mice who live in the woods, and he comes back to visit very often. Whenever he passes by, he is sure to spend wonderful days with his favourite group of friends!